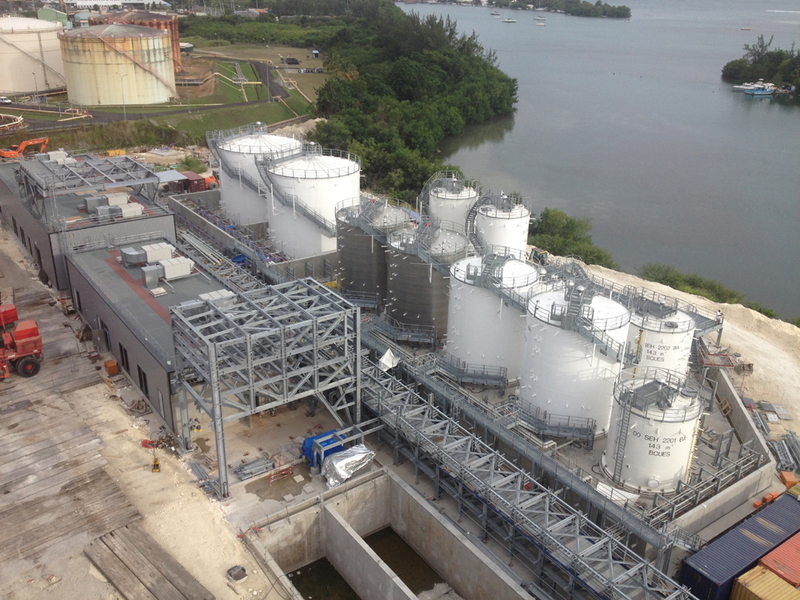 EDF gave Man Diesel the task to invest in the construction of a new, more efficient, power plant in Pointe Jarry (Guadeloupe). The start up is foreseen mid 2014. Geldof was assigned to fabricate and install 18 shop-built tanks through MAN Diesel & Turbo SE (MDT) for the . EDF PEI electricity power plant in Guadeloupe. These tanks will store the fuel for 12 diesel engines (18.3 MW). These new engines will be equipped with the latest technology and will therefore will be more efficient and have a lower emission. The power plant will be able to sustain the needs of Guadeloupe in a durable manner. In June and September 2013 our team was already present in Guadeloupe for the delivery and installation of the tanks. It wasn’t an easy task as all of the tanks needed to be lifted over a conveyor that blocked the passage over the main road of the Island. In the end all of the tanks were succesfully placed onto their foundations. This time a few of our experts went back to the site to finalize the last items. A lot of preparation was needed since we needed to take into account more activities of subcontractors and higher safety measures. At the site the insulation, painting,… were completed. After a few inspections the 16 tanks were approved by the client.